Still loving my jeep! 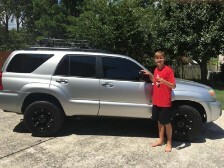 New tires and wheels ! Thank you CRM and Michael !  At CRM Motors Pelham we are proud of the quality used cars we sell and our dedication to serve the needs of our customers. This is reflected in the amount of repeat business we receive. Whether this is your first purchase with us or one of many that you’ve had, you can count on our dedicated sales staff to make it the best buying experience possible. We purchased a first car for our son from CRM recently. There is comfort in knowing you are dealing with good people (owners, sales folks, etc.) when spending this kind of money and more importantly putting your son in a vehicle for the first time. Give them a try, our experience was excellent. I am so happy with the customer service me and my wife received Saturday. We purchased a new truck for our growing family and the staff was amazing. Our sales guy Brad help me find the right truck that was in our price range and had everything I asked for. The finance manager Kacey got us a wonderful rate and worked hard to make us happy even helping us when our 9month old started getting fussy. If you are in the car shopping process I HIGHLY Recommend CRM! I love my Kia Soul that I bought from CRM Motors. The Soul was exactly what I was looking for. Clean, low mileage and plenty of head, foot and storage space. When it is time for a replacement car, CRM Motors will be my first stop. 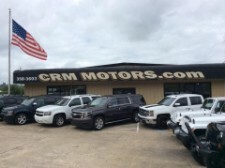 I highly recommend CRM Motors when you are shopping for a great deal. 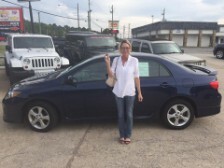 hank you Kasey Graydon for making my car purchase so quick and easy! I highly recommend this company, they exceeded my expectations not just in their work but also in their customer service! From the moment I walked on the lot I was greeted and helped and felt like more than a customer. They really went the extra mile to meet all my needs and I encourage everyone to come here. Great place to get a car and I will be back! The staff here is great ! They get you what you want & get it quick . I love my Infiniti already & I haven't even drive her off the lot yet ! Y'all come down here & let Tracy & them fix you up !